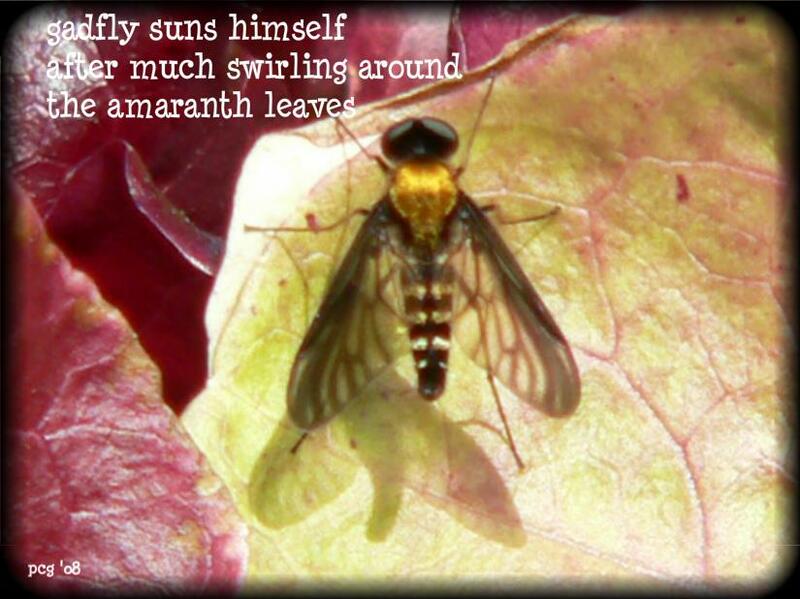 The gadfly has two wings, resembles a fly (hae) but is much bigger and has a lighter color. Her belly part has a nice shimmer. She is sometimes mistaken for a bee, but a bee has four wings. There are many types of gadflies the one which drinks the nectar of flowers (hana-abu 花虻, hime-abu 姫虻) is well known. Another kind drinks the blood of horses, cattle and sometimes even humans (ushi-abu 牛虻). On spring days, we can hear the sound of the gadflies wings, which brings about a carefree, leisurely atmosphere and invites us to take a nap. Well, to use the word “nonbiri”, leisurely, to describe the gadfly swirrling around, I must say, that surprized me. Reading the above explanation, the gadfly must have been a nice, welcome visitor of spring. the tabanids or horse flies, a family of insects that bite humans and other animals to get blood. It includes the genera Chrysops, Chrysozona, Diachlorus, Goniops, Haematopota, Hybomitra, Silvius, and Tabanus. Many species are vectors of disease. [L. “gadfly”] a genus of biting, bloodsucking flies of the family Tabanidae; they transmit trypanosomes and anthrax to various animals. Tabanus atractus, the common black horsefly of North America. Tabanus bovicnus, a species that attacks cattle in Asia, Africa, and South America. Tabanus ditaeniactus, Tabanus fasciactus, Tabanus gractus, the Seroot fly of the Sudan, which is very troublesome to humans and other animals. A gadfly, such as the one BRIZE sent by Hera to plague Leto. Brize was the Gadfly Hera sent after Io to torment her. This gadfly was the size of a sparrow with a stinger as big as a dagger. Hermes, who eventually was sent by Zeus to save the poor girl (or cow) killed the gadfly. If you want to know more, check out the Myth Pages. In case you didn't figure it out, Brize means Gadfly. I suppose, "gadlfy" (Bremse, Pferdebremse) may be a summer kigo here in Central Europe. Its first appearance is in May-June, late spring or early summer; but mainly noticed during July to September, even from May to October.
. WKD : Kobayashi Issa 小林一茶 . This hokku was written in the 5th month (June) of 1816, when Issa was living in his hometown. It was written right around the time of the death of his infant eldest son on 5/11. The boy had been born on 4/14, and his death or impending death is probably reflected in the sadness Issa feels when he sees the how some of the young rice shoots are treated during rice planting. Nari makes the scene objective, but Issa's emotional waves of sympathy are palpable. More rice shoots were customarily grown than could be planted, and when the young shoots were carried out and transplanted into the wet paddy, those doing the planting would discard shoots that looked weak or not very vigorous. (Usually it was women who began the planting while singing traditional planting songs, since it was believed that women had more ability to make the shoots grow than men, a belief probably coming from shamanism). In the hokku these rejected shoots have been collected and are now kept as spares, for use in case some of the planted shoots don't grow well or get uprooted and float away. Generally rejects were floated in the water in one corner of the paddy or stuck into the mud at the border of the paddy. The shoots in the hokku seem to be stuck in the mud, perhaps bent over and lying on it, since flies and horseflies are constantly lighting on them and treating them as if they were nothing at all, even though they have the potential to become tall stalks of rice. Perhaps they are doubly spares that never found a use and are now completely ignored. It seems difficult for them to stay alive much longer. The strong language of the hokku recalls the horror expressed by an old woman in one of Issa's haibun when samurai authorities ask her to sell her house so they can destroy it, along with her rice crop, just as they have destroyed the rice plants in nearby paddies. A chick seems to have fallen out of its nest and gotten lost, and Issa obviously feels they could share a lot together. Issa knew from various experiences what it was like to suffer and be discriminated against, though he never lost his faith in Amida. His ability to see both sides of experiences was a major factor in his willingness to go beyond the objective, descriptivist approach to haikai and to dialog with the world in personalistic, emotional terms. This autumn hokku is from the 9th month (October) of 1821, when Issa was living in his hometown. The hokku makes an allusion to a proverb, "Not catching horseflies and not catching wasps," which means to do too many things at once and therefore to fail at everything. The proverb is based on the image of an impatient spider trying to catch a horsefly and a wasp at the same time, thereby allowing both to escape. The proverb is therefore about losing the ability to do multiple things due to lack of concentration. Issa humorously takes the proverb literally, but he is not a spider, so "catch" (toru) takes on another meaning: to remove or drive away. He and the others at a moon-viewing party on either the full-moon night of 8/15 or the nearly full-moon night of 9/13 try to enjoy food and drink and possibly music as they praise the moon and perhaps write hokku about it, but they are harassed by horseflies and wasps and no doubt by other insects as well, and they try to drive them away with their fans and their hands. Some people may be trying to swat the insects as well. As soon as they turn to drive away or swat one insect, however, another attacks from a different direction. The insects come from so many directions that soon everyone at the party is bitten multiple times. In spite of the pain, the great beauty of the moon and the conversation taking place in its light seem to keep the party going. Very funny Reading Abu Haiku with Japanese friends after Abu attack in Isu. Maybe you could add info about what happens with foriegner gets stung by Abu in Japan? I was stung many years ago and had huge incredibly painful swollen ankle and could not walk for three days! what happens when a foreigner gets stung in your country ? same as when a Japanese is stung, same here ... go see a doctor, if it is too bad.